The Surgical Robotics (SR) researchers investigate problems, identify enabling technologies and develop solutions for addressing the field of minimally invasive and targeted therapy and diagnosis. The SR group addresses the main scientific problem of covering the gap between diagnosis and therapy, by blending together competences coming from robotics and bioengineering and by developing platforms, enabling technologies and components with the ability to treat many pathologies in the human body, including in hard-to reach areas (e.g. in the cardiovascular system, in the respiratory apparatus, in the central nervous system, in the abdominal cavities, etc.). This group aims at developing smart and miniaturized technological tools that allow clinicians to perform less invasive, faster, more precise and safer surgical/medical procedures, or directly allow the patient to improve his/her quality of life, by means of implantable or wearable technologies. SR group also aims at developing miniaturized and controllable tools for in vitro and in vivo diagnostics, regenerative medicine and cell engineering procedures, by merging the competences and research interests of both robotics and bioengineering. This research line collects all projects devoted to the development of robots, capsules, instrumented catheters, and probes able to operate and navigate in the human body for diagnostic and therapeutic applications. Therapy and diagnosis can be performed in the human abdomen, in the cardiovascular system, in the gastrointestinal tract, but also in other hard-to-reach districts. The typical size of devices entering the human body ranges between 10 cm and tens of microns, depending on the target area and the patient (which can be an adult as well as a child before delivery). This research line includes projects devoted to develop sensing systems for health monitoring or for health assistance (e.g. for people with ventricular assistive devices), as well as visualization technologies for endoluminal devices. More specifically, there is a strong competence in the development of vision sensing systems, illumination devices, and ancillary sensing technologies to be used in different cavities of the human body. This research line includes a broad range of novel technological solutions aiming at significantly improving or even revolutionizing the possibilities and performances of current sensors, actuators and mechatronic systems. Such solutions rely on the development and assembly of smart materials and micro/nano-particles, also exploiting some intriguing properties of these systems (e.g. 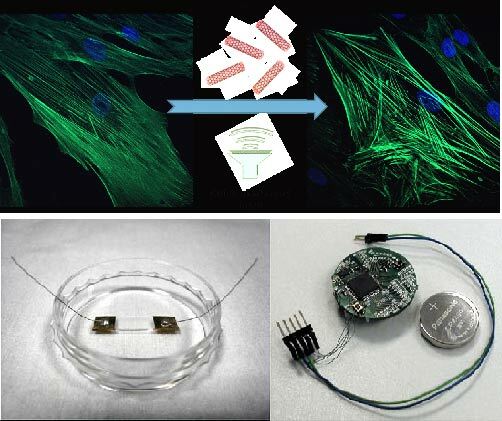 piezoelectricity) and on the integration of living cells and tissues within bioartificial structures, towards the development of bio-hybrid systems. J. L. Gorlewicz, S. Battaglia, B. F. Smith, G. Ciuti, J. Gerding, Arianna Menciassi, K. Obstein, P. Valdastri, and R. J. Webster III: Wireless Insufflation of the Gastrointestinal Tract. IEEE Transaction on Biomedical Engineering, vol. 60, no. 5, 1225-1233, 2012. S. Tognarelli, V. Castelli, G. Ciuti, C. Di Natali, E. Sinibaldi, P. Dario, A. Menciassi: Platform for Magnetic Propulsion and Ultrasound Tracking of Endovascular Devices. 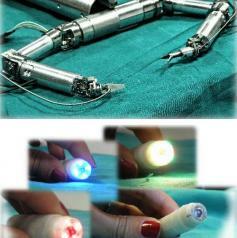 Journal of Robotic Surgery, vol. 6, no. 1, pp. 5-12, 2012. G. Ciuti, M. Salerno, G. Lucarini, P. Valdastri, A. Arezzo, A. Menciassi, M. Morino, P. Dario: A comparative evaluation of control interfaces for a robotic-aided endoscopic platform. IEEE Transactions on Robotics, vol. 28, no. 2, pp. 534-538, 2012. G. Ciuti, R. Donlin, P. Valdastri, A. Arezzo, A. Menciassi, M. Morino and P. Dario: Robotic versus manual control in magnetic steering of an endoscopic capsule. Endoscopy, vol. 42, pp. 148-152, 2010. S. Tognarelli, M. Salerno, G. Tortora, C. Quaglia, P. Dario, M.O. 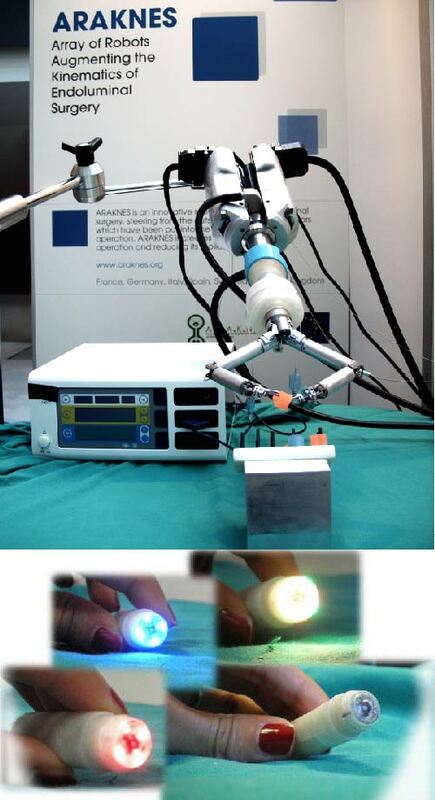 Schurr, A. Menciassi, A miniaturized robotic platform for natural orifice transluminal endoscopic surgery: in vivo validation. Surgical endoscopy, 1-8, 2015. G. Tortora, P. Dario, A. Menciassi, Array of Robots Augmenting the Kinematics of Endocavitary Surgery, Mechatronics, IEEE/ASME Transactions on, 19(6), 1821-1829, 2014. A. Verbeni, R. Fontana, M. Silvestri, G. Tortora, M. Vatteroni, M.G. Trivella, P. Dario, P. An innovative adaptive control strategy for sensorized left ventricular assist devices. Biomedical Circuits and Systems, IEEE Transactions on, 8(5), 660-668, 2014. J.L. Toennies, G. Tortora, M. Simi, P. Valdastri, R.J. Webster. Swallowable medical devices for diagnosis and surgery: the state of the art. Proceedings of the Institution of Mechanical Engineers, Part C: Journal of Mechanical Engineering Science, 224(7), 1397-1414, 2010. G. Ciuti, L. Ricotti, A. Menciassi, P. Dario. MEMS sensor technologies for human centred applications in healthcare, physical activities, safety and environmental sensing: a review on research activities in Italy. Sensors. S. Betti*, G. Ciuti*, L. Ricotti*, M. Ghionzoli, F. Cavallo, A. Messineo, and A. Menciassi. A Sensorized Nuss Bar for Patient-Specific Treatment of Pectus Excavatum. Sensors. 14(10): 18096-18113; 2014. Gastone Ciuti - Lab: "Computer-Integrated Technologies for Robotic Surgery"